the temperatures on Day 1, when Jane drank about 15L of fluid during the day’s running. 660km later, Jane and Suze running into Birdsville – just 50 metres from Australia’s most famous pub! She Did It!! 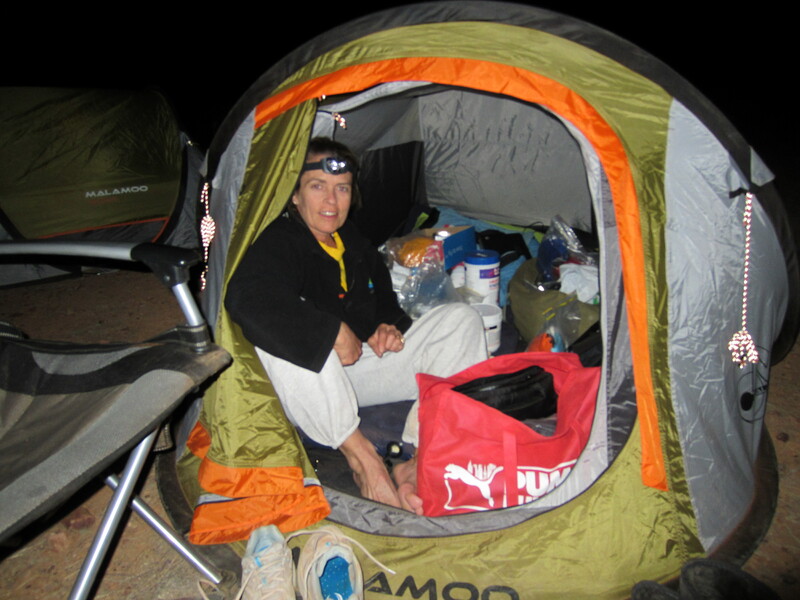 Jane Trumper, First Lady of The Simpson Desert! Congratulations Jane!! Jane will no doubt be putting her own words here soon. I’m Roger Hanney, I’ve crewed Jane for the last 2 Coast 2 Koscis and have been watching her Spotwalla tracker over the last week and a half trying to work out what’s going on and making the best guesses I could to update supporters through the Desert Storm Facebook page and updates from gear sponsors Hoka OneOne and Northside Runners Manly. Whether by weather, roads, or water on the ground, it looks like she has completed the 650km crossing by running an astounding 750km in 10 days, having started – of course – on April Fools Day. I know that she was fixated on this event – a seemingly mad solo crossing, racing without competition to complete a run that only fires and safety fears had been able to stop last year. 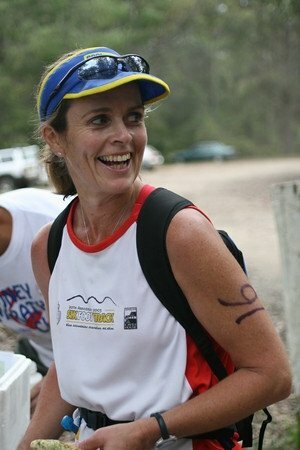 Her passion for distance running and notable conquests as she will also no doubt knock off her 100th marathon this year has fuelled her drive to beat back nature in Australia’s molten red centre. But she also has a massive passion for her charity of choice – Bear Cottage. They’re a charity that flies under the radar in an age of pink-shirted footy players and front pages devoted to turning the tv off for an hour, but Westmead’s charity for really sick kids creates a homely environment in the city where families from the country can spend time with their sick little loved ones, away from the noise and hostile industrial sterility of a hospital ward. And if miracles don’t happen, there is even a bedroom kept at low temperatures where parents can spend an extended time with their unfairly selected child before saying goodbye. It might sound macabre, but it is part of a loving, real world solution to an awful situation, and for the children and families affected it means greater opportunity for real healing than can be found in a barren strictly medical environment. Hopefully Jane’s great big run will inspire some people who have followed this brave undertaking to support some families facing massive challenges of their own. Here’s what appears to be the first piece of news media about Jane’s Simpson Desert Crossing – running roughly 750km over 10 days.